Preheat the oven to 375 degrees. First, make the red sauce: In a large skillet over medium-high heat, saute the garlic and crushed red pepper in olive oil for about a minute, just until fragrant. Add the tomato paste and stir to combine thoroughly; cook about 30 seconds to 1 minute, until the paste starts to “rust” and release an orangish oil into the pan. Add the crushed tomatoes, basil, oregano, salt, and pepper, and stir to combine. Cover, bring to a boil, and reduce the heat to low; simmer, stirring occasionally, for about 30 minutes. With the red sauce simmering, you can make the white sauce: in a medium saucepan over medium-high heat, melt the butter and oil together. Add the flour and whisk until it makes a paste, then cook for about 2 minutes, stirring. Gradually pour in the milk or cream, whisking the whole time to prevent lumps. Once all the milk is in the pan, bring the sauce just to a boil, then reduce the heat to low and add the nutmeg, salt, and pepper. Let the sauce simmer gently until it’s thick enough to coat the back of a wooden spoon, about 5-10 minutes. While the white sauce is simmering, cook the pasta according to package directions, but drain it about 2 minutes prior to being fully cooked (you still want a little extra bite to it, since it will be baked in sauce and will cook more in the oven). Drain the pasta thoroughly, then toss with the red and white sauces, spinach, and ricotta cheese, reserving about 1/2 cup of the red sauce. Taste and season with salt and pepper as needed. 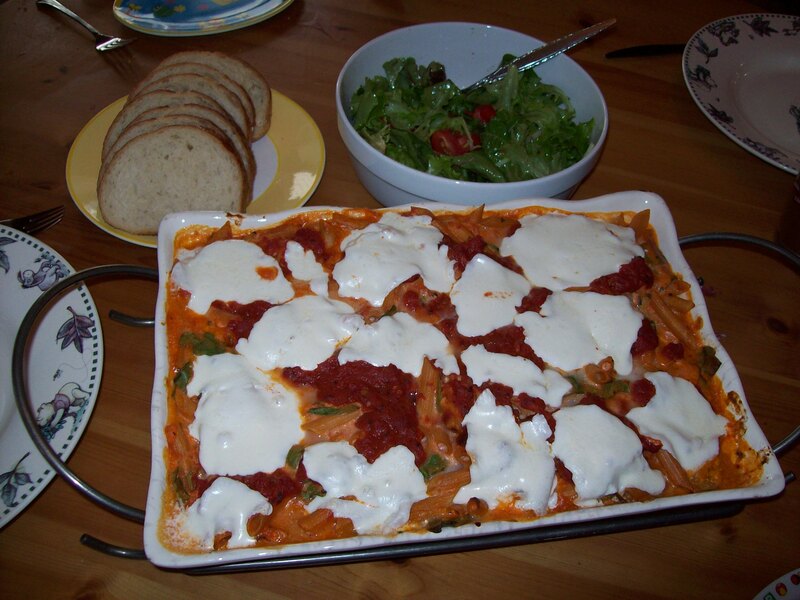 Pour into a 9×13 baking dish and drizzle the remaining red sauce over the top, then cover tightly with foil. Bake at 375 for 30 minutes, then remove the foil and place the sliced mozzarella evenly over the top. Bake, uncovered, an additional 10-15 minutes or until the cheese is melted and bubbly.